There were plenty of new bikes on show at Core Bike, plus the latest other products and technology. Despite it’s fairly understated designed, the new Ritte Ace was one of the most eagerly-anticipated bikes at Core Bike. The Los Angeles-based brand has quickly built a reputation for producing stylish frames which deliver on both performance, and the Ace is no different as it takes over from the Vlaanderen as Ritte’s flagship racing model. The Ace inherits the Vlaanderen’s geometry, but comes with one-piece monoque construction and ditches the integrated seatpost. A slightly flaired head tube also gives the frame a bit of an aerodynamic look . The aluminium-framed CK3 Giro is designed as the perfect steed for sportives and entry-level races and is available in a range of builds including a version with Campag Veloce components at an eye-catching price of £799.99. The bike shown here is put together with Shimano Sora shifters and derailleurs and FSA chainset, and is available for £654.99. 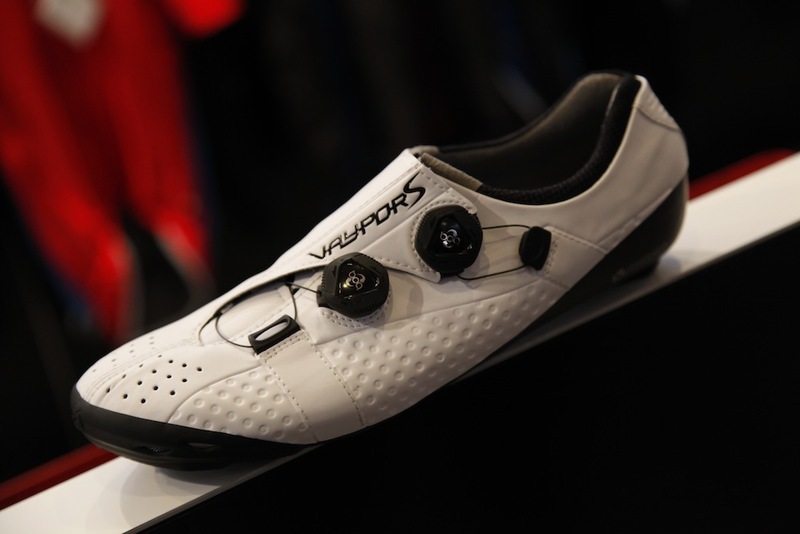 Bont were understandably keen to show off their new Vaypor S road shoe, an evolution on the popular Vaypor. The most noticeable change is the move to Boa dials instead of the ratchet and Velcro straps seen on the standard model, which should make adjustment on the move that bit easier. The Boa system also helps to shed weight, while the golf ball-like pimpled surface should help aerodynamics. 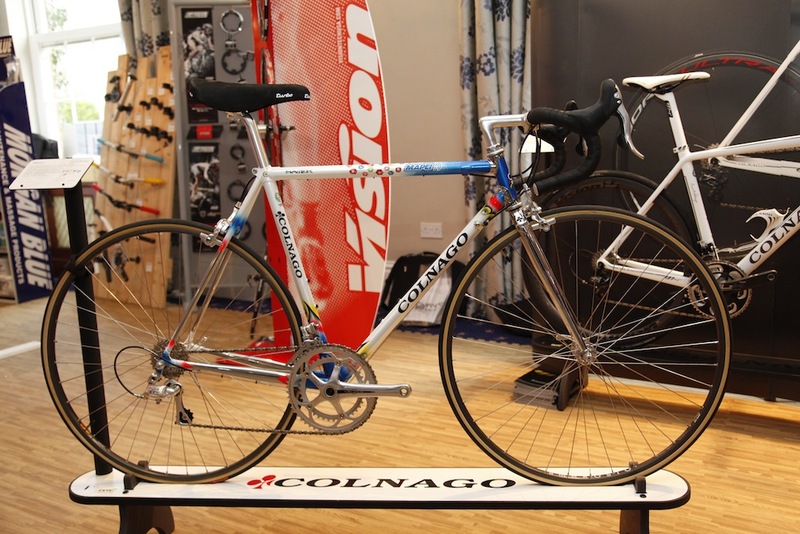 Not so new for 2015 is the Colnago Master, a steel-framed beauty that has been appearing out of Lombardy since the mid-1980s. This model, which in our opinion was upstaging many of the carbon-fibre superbikes surrounding it, is the 30th anniversary and comes painted in iconic Mapei colours. Of course Campag is compulsory, with this model making use of the entry-level Veloce groupset, with the retro look completed with a set of Ambrosio rims. Another bike brand that has been busy over the winter is Kinesis who are now producing disc brake versions of all of their road frames featuring flat mount disc brakes to allow them to accommodate Shimano’s yet-to-be-unveiled disc brake standard. 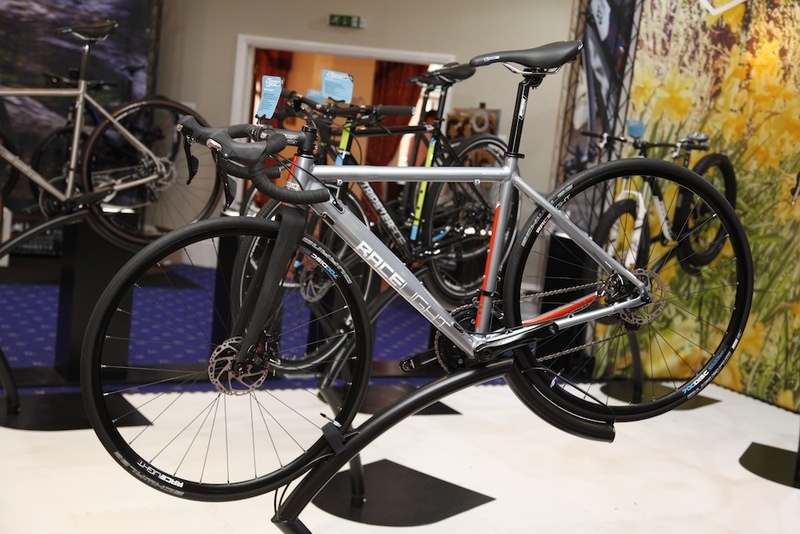 The model shown above is the revamped Racelight 4S which Kinesis describe as the ‘ultimate winter bike’ which comes with carbon fork on an aluminium frame as well as shaped seatstays for extra comfort, and built with a Shimano 105 groupset and FSA/Kinesis finishing kit. The frame also features enough clearance to fit 28mm and mudguards. There’s no word yet on price or availability of the disc brake version, but with the rim-braked version is priced at £1279.99, we’d expect to be looking around the £1400 mark. Integrating some form of suspension into a bike frame is nothing new. Specialized have used Zertz technology in their Roubaix, Ruby and Secteur frames for years now in an attempt to aid ride comfort, and the Trek IsoSpeed system in the Domane does much the same. The Time Aktiv fork is the latest attempt to ease the toll of road vibration, and works by incorportating a dampener consisting of a lightweight piece of aluminium attached to carbon-fibre strands into the fork (as illustrated in the cutaway version above) which then acts to dissipate the vibrations of rough road surfaces without affecting the overall stiffness of the frame. Of course we’re yet to see how this plays out on the road, but Time is obviously pretty confident as it has made the fork available one all of its 2015 models. Also from Time is the new Xpresso 15 pedal, the lightest pedal that has ever come out of the company’s Lyon factory, or many other factories for that matter. 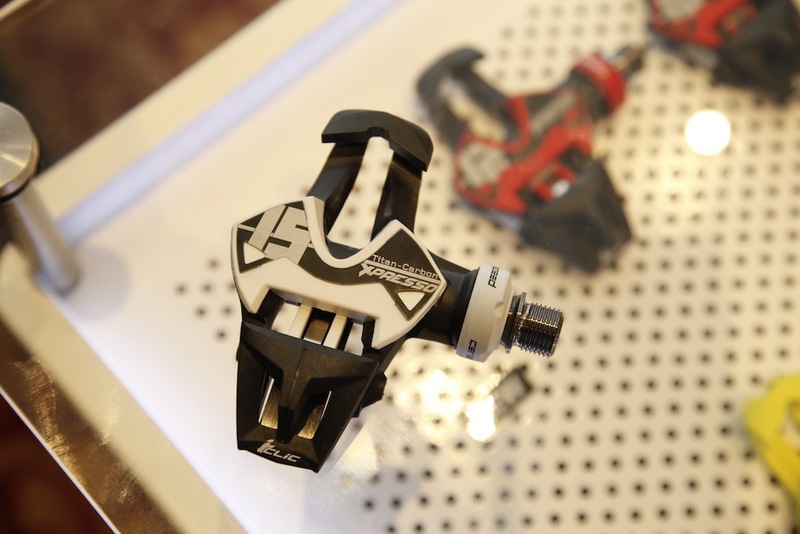 At 66.5g per pedal, the Xpresso 15 is even 7g lighter per pair than the Speedplay Nanogram Zero Ti. As you’d expect there are a lot of fancy materials that go into making such a light pedal that won’t fall to pieces on the road. 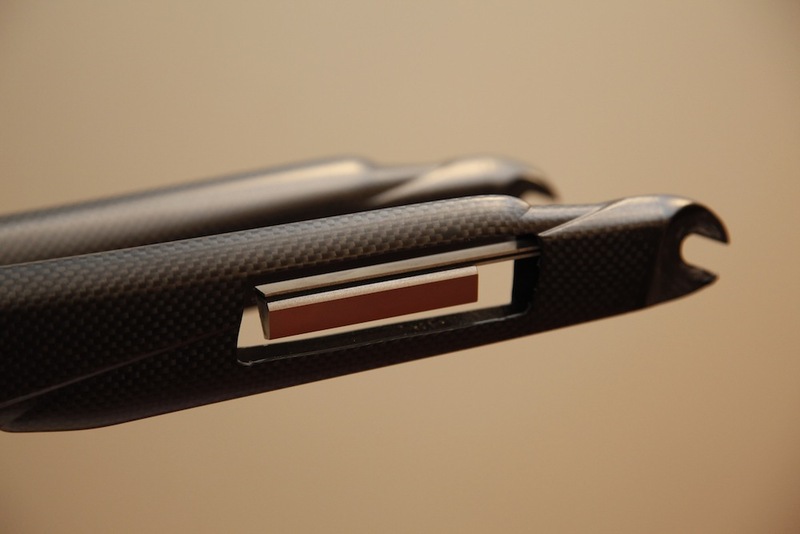 The body and blade are both carbon, and are mounted on a titanium axle with ceramic bearings. Of course this sort of technology doesn’t come cheap, and a pair of Xpresso 15s will set you back an eye-watering £399.99. Then again, they do chuck in a pair of cleats for the price. 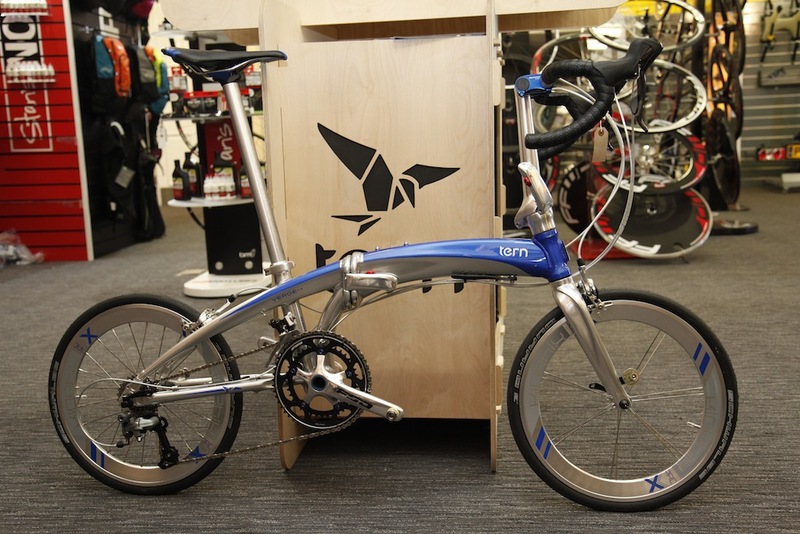 Last but by no means least is this unique-looking folding bike from Tern that aims to give a classic commuting design more of a road bike feel. The most eye-catching piece of roadie kit on this Verge X18 model is the set of drop handlebars, but also note the standard 53/39t FSA chainset and Ultegra rear derailleur. 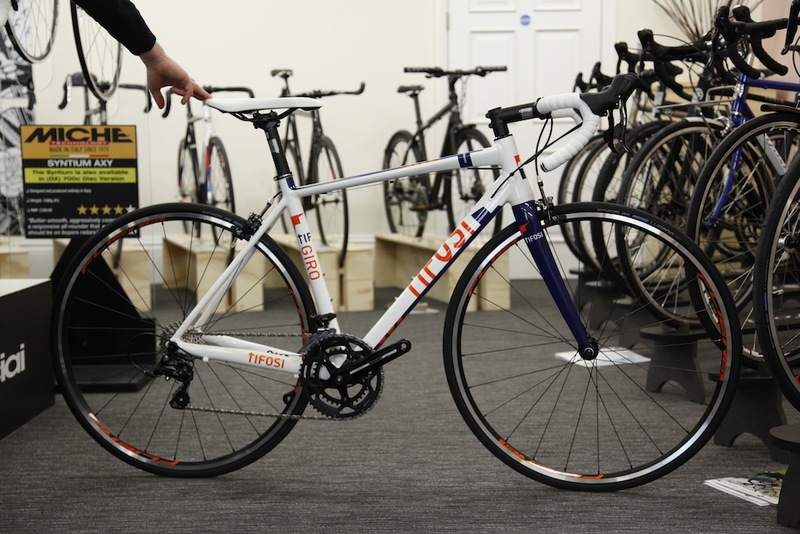 The price, £1700, certainly isn’t cheap but it’ll definitely get you to the office a few minutes earlier.